I first heard about "The Elf on the Shelf " last year from my sister in laws, and quickly realized what a cute idea it was. Well, I searched and searched this year, and finally found a copy of our own today (it was the last copy). We implemented our new little "tradition" tonight at bedtime when we read the book to Avery as her nuh-night story. 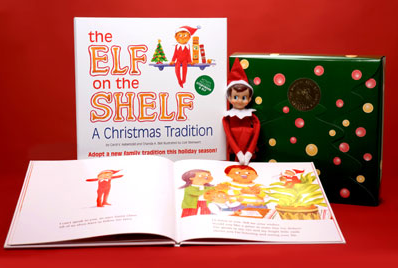 Here's the scoop on "The Elf on the Shelf". Mr. Elf comes to visit your home during the holidays. He watches over the home and reports back behavior to Santa each night. The next morning he comes back and sits in a new location. Your kids get to search him out each day. On Christmas Eve, he returns to the North Pole and stays there until next year. I have to say, I wish I would have found this a couple of weeks ago. This could have been a REALLY good behavior deterrent for the 2 little boys I watch. You better bet that I would be saying things like "Cookie is watching", and "What do you think Cookie is going to report to Santa tonight?" I think that this will be a fun tradition. I know that Avery might be a little young, but she really liked the book, and I like that all of her Christmas memories will include this family book and tradition. I'm looking forward to reminding her to look for Cookie in the morning! ***Update...Avery found Cookie on her own this morning, and asked for the book to be read at naptime too. I think we have a hit! What a great idea! I'll have to remember this for when Isabelle is older.